OUR COMPETITIONS CONSIST OF AMATEUR, MASTERS AND WOMENS CLASSES. THE VARIOUS TYPES OF EVENTS ARE LISTED BELOW WITH DESCRIPTIONS. 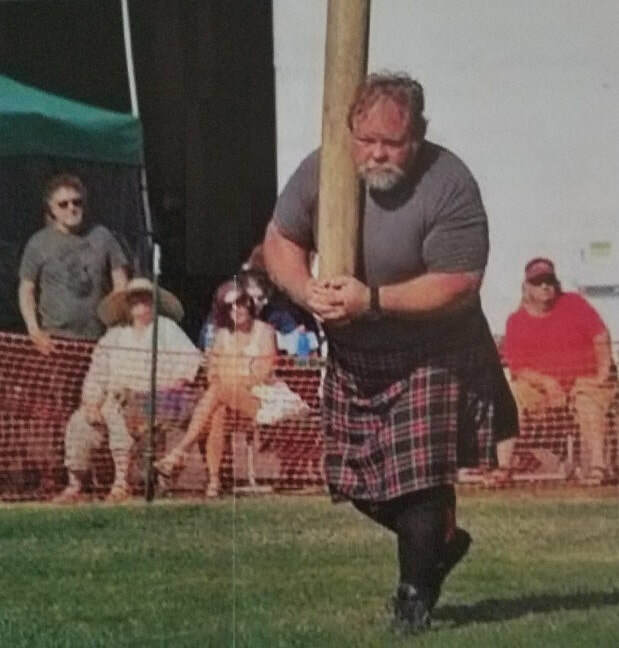 "IN HONOR OF MY FRIEND AND LEADER OF THE SAN DIEGO BLACK SHEEP"
​The origins of what we know as highland games aren't precisely known. It is presumed that they started as contests of strength, speed, agility and skill which were common during the various clan gatherings of medieval Scotland. Highland chieftains would gather their clans together to celebrate in times of peace. There the men of the clans would test their physical fitness, as these events provided a great excuse to challenge each other in running, jumping, wrestling, and with early forms of weight putting with boulders. Such games also ensured that the Highlanders would keep fit for war. This changed after the end of the Jacobite Rebellion and the defeat of the Bonnie Prince Charlie at the Battle of Culloden on April 16, 1746. After the defeat, the ruling government’s forces devastated the highlands with new laws designed to make future rebellions impossible. These new laws led to the largest uprooting of Highlanders in history, and a complete alteration of the highland way of life. Highlanders were made to swear an oath to obey the Disarming acts, and the wearing of the kilt and tartan, playing of the pipes and the carrying of arms were all banned. Highland chiefs were stripped of their powers and became mere landlords. With these new laws strictly enforced, the old highland way of life came to an end, and the highland games virtually disappeared. It was only with the renewal of interest in Scottish heritage in the 19th century that the modern Games came about, a revival that is kept alive in celebrations of Scottish heritage such as this. Today those competitions are recreated in events such as the stone put, the weight for distance throw, the hammer throw, the sheaf toss, weight for height and the famous caber toss. ​Open Stone – A stone put from a throwing area that measures 4 feet, 6 inches wide by 7 feet, 6 inches long. The stone must be put with one hand and with the stone remaining against the neck throughout the throw until the release. Any throwing style may be used as long as the rules are followed and the style is deemed safe by the judge. You will notice at the higher levels, this begins to look a lot like Olympic shot put. Stone Weights – Men 16-22 lb., Women 8-12 lb. Braemar Stone – Same as the Open Stone, except the stone is heavier and the competitors must throw from a standing position with no approach allowed. Stone Weights – Men 20-26 lb., Women 13-18 lb. Heavy Weight For Distance – A metal weight is thrown with one hand from a throwing area that measures 4 feet, 6 inches wide by 9 feet long. The weight can be of various shapes and sizes, including spherical, bullet or box-shaped. The handle can either be attached directly to the weight or attached with a length of chain. Any style may be used to throw the weight as long as the athletes feet stay in bounds. Usually a spinning technique is used. The longest throw wins. Implement Weights – Men 56 lb., Women 28 lb., Masters/Novice 42 lb. Light Weight For Distance – Same as the Heavy Weight for Distance, just lighter. Implement Weights – Men 28 lb., Women 14 lb. Light Hammer – Same as the Heavy Hammer, just lighter. Light Hammer Weights – Men 16 lb., Women 12 lb. Sheaf Weights – Pros 20 lb., &Amateur 16 or 20 lb., Masters 16 lb., Women 12 lb. Weight for Height or Weight Over Bar – ​Weight Over Bar Also known as weight for height. The athletes attempt to toss a 56 lb weight with an attached handle over a horizontal bar using one hand. For master’s the weight is 42 lbs and women 28 lbs. Each athlete is allowed three attempts at each height. Successful clearance of the height allows the athlete to advance into the next round at a greater height. Outcome of competition is determined by the highest successful toss with fewest misses possibly being used to break tie scores. THE COSTS OF RUNNING THE HIGHLAND GAMES INCREASE EACH YEAR AND OUR FULLY VOLUNTEER STAFF WORKS HARD TO KEEP COSTS DOWN AND GENEROUSLY SUPPORTS THE GAMES TOO. YOU CAN HELP BY SPONSORING A MEDAL SET FOR AN EVENT FOR $25 OR A TROPHY/PLAQUE SET FOR $50. SPONSORS WILL BE LISTED ON THE WEBSITE AND IN THE PROGRAM BOOK. FOR MORE INFORMATION ON COMPETITIONS, RULES AND TRAINING, PLEASE VISIT THE NORTH AMERICAN SCOTTISH GAMES ASSOCIATION BY CLICKING THE LINK BELOW.